Jacob & Company Several at Drastic Discounts! Jacob & Co SS Five Timezones With Diamond Dial & Diamond Screw Bezel! Model with Five Times Zones,48mm with lugs x 40mm. Sell for $4,250 or TRADE! Jacob & Co SS Capri With 3 Timezones With SS Braceet & Deployant! Massive 67.5mm with lugs x 33mm. Sell for $3,950 or TRADE! Jacob & Co Monster Six Timezones Strap & Deployant Clasp! 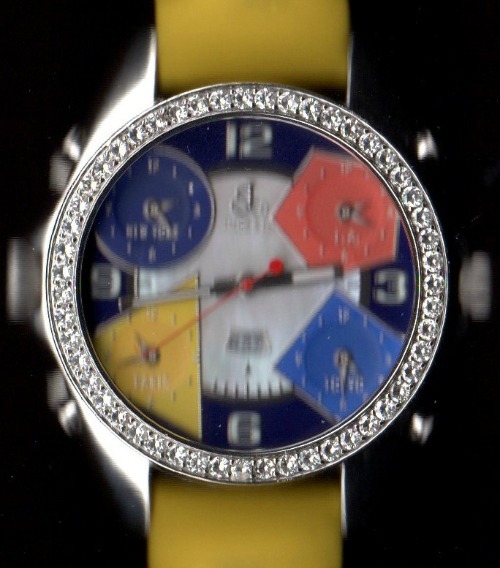 The SS MONSTER is dual sided with Five Timezones on one side, multicolored dial Black, Blue, Yellow & Red with MOP center & 1 Timezone plus diamond bezel with MOP dial on the other side, date wheels for both sides, Huge 48mm x 58mm with lugs, five quartz movement, sapphire crystals, 6 timezones total, This was a extremely limited edition of the Monster. 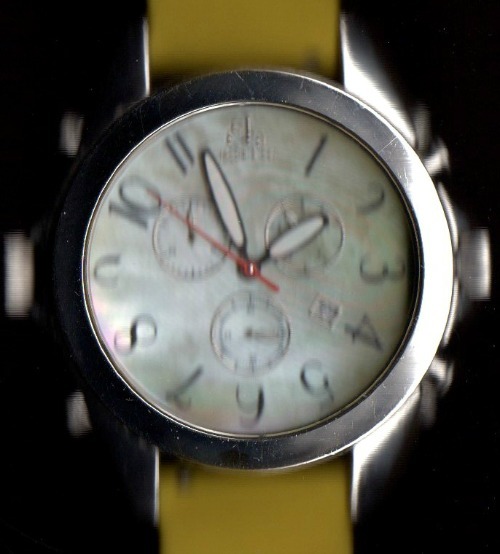 Yellow strap with SS deployant clasp. Retail was HUGE $$$ well approaching mid $30k...Sell for $14,750 or trade! Jacob & Co Titanium Automatic Diamond Bezel Five Timezone With Titanium Deployant Clasp! Titanium Five Timezone With Titanium Bracelet & Deployant Clasp plus Black strap & Deployant clasp. Huge 47mm x 53mm with lugs, automatic movement plus 4 quartz movements, sapphire crystal, 5 timezones total, Black dial with total diamonds even on large Roman hour numerals, diamond bezel. Extremely limited edition of only 72 automatics produced in Titanium with total diamond dial plus diamond bezel plus Titanium bracelet medium length with deployant clasp. Retail was HUGE $$$...Sell for $8000 or trade! Jacob & Co Five Timezones & Date! Five Timeaone & date JC11, photo is stock photo, actual band is Brown color, new Demo condition with huge woodedn box plus outer box & open papers, huge 47mm x 53 mm with lugs. 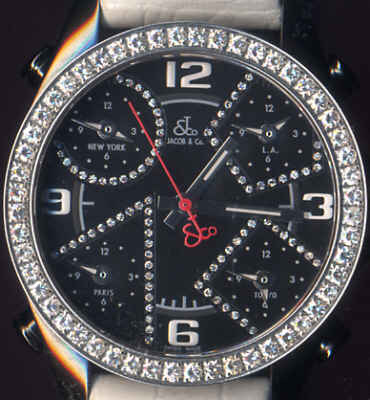 SS, Black dial 4 colors with date, Sapphire crystal, screw on bezel & extra bezel for adding diamonds later. 100 meter, Jacob strap with Jacob deployant buckle. 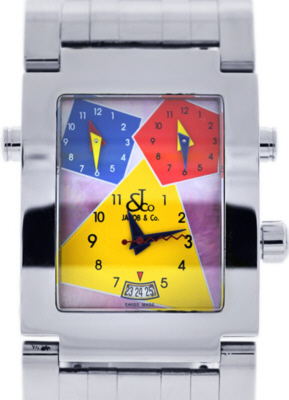 Five Time Zones driven by 5 independent high-quality battery operated Swiss Movements. Local Time is indicated by the large display. 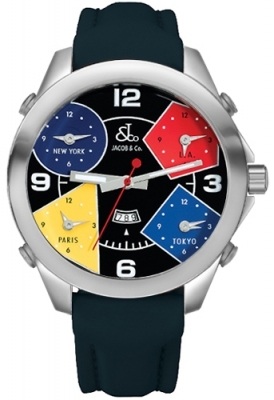 LA, NY, Paris & Tokyo are displayed in the sub-dials. Black dial with solid color TimeZones. Retail was HUGE approaching $7,000 $$$...Sell for $1,500 or trade!